Distinct dendritic cell subsets exist as rare populations in lymphoid organs, and therefore are challenging to isolate in sufficient numbers and purity for immunological experiments. Here we describe a high efficiency, high yield method for isolation of all of the currently known major subsets of mouse splenic dendritic cells. Arora, P., Porcelli, S. A. An Efficient and High Yield Method for Isolation of Mouse Dendritic Cell Subsets. J. Vis. Exp. (110), e53824, doi:10.3791/53824 (2016). Dendritic cells (DCs) are professional antigen-presenting cells primarily responsible for acquiring, processing and presenting antigens on antigen presenting molecules to initiate T-cell-mediated immunity. Dendritic cells can be separated into several phenotypically and functionally heterogeneous subsets. Three important subsets of splenic dendritic cells are plasmacytoid, CD8αPos and CD8αNeg cells. The plasmacytoid DCs are natural producers of type I interferon and are important for anti-viral T cell immunity. The CD8αNeg DC subset is specialized for MHC class II antigen presentation and is centrally involved in priming CD4 T cells. The CD8αPos DCs are primarily responsible for cross-presentation of exogenous antigens and CD8 T cell priming. The CD8αPos DCs have been demonstrated to be most efficient at the presentation of glycolipid antigens by CD1d molecules to a specialized T cell population known as invariant natural killer T (iNKT) cells. Administration of Flt-3 ligand increases the frequency of migration of dendritic cell progenitors from bone marrow, ultimately resulting in expansion of dendritic cells in peripheral lymphoid organs in murine models. We have adapted this model to purify large numbers of functional dendritic cells for use in cell transfer experiments to compare in vivo proficiency of different DC subsets. Dendritic cells (DC) were discovered almost forty years ago as the "large stellate (Greek dendron) cell" found in lymphoid organs1. Many studies have shown that DCs are the only antigen presenting cells that can effectively stimulate naïve T cells2. A major function of these cells is the uptake and presentation of antigens and their efficient processing and loading of these onto antigen presenting molecules. In mouse spleen, DCs can be separated into plasmacytoid and conventional subsets. The plasmacytoid DCs are characterized by low expression of CD11c and high levels of B220 and Gr-1. They are also positive for the surface marker mPDCA1 and secrete type I interferon in response to toll like receptor 9 (TLR9) ligands. The conventional DCs are high for CD11c and MHC class II expression. They can be split into three distinct subsets based on the surface expression of phenotypic markers such as CD4, CD8α, DEC205, CD11b and dendritic cell inhibitory receptor 2 (DCIR2, recognized by the 33D1 antibody) proteins 3,4. The CD8αPos DCs are also known as cDC1, are positive for DEC205, but negative for myeloid markers such as CD11b and 33D1. The CD8αNeg DCs, also called cDC2, are positive for 33D1, CD11b and CD4 but lack DEC205. The double negative subset (i.e., negative for both CD4 and CD8α) is relatively rare, and is negative for DEC205 and 33D1. It is the least characterized subset and may be a less differentiated form of CD8αNeg DC. Phenotypic differences in the various DC subsets also extend to their in vivo functions. The CD8αNeg DCs are highly phagocytic and are thought to present exogenous antigen mainly via MHC class II to CD4 T cells 3. In contrast, the CD8αPos DCs are specialized for presentation of soluble protein antigen on MHC class I in a mechanism called cross-presentation. The outcome of cross-presentation depends on the activation status of these DCs5, and can either lead to expansion of cytotoxic T cells (CTLs) or development of regulatory T cells 62,7. Targeting of antigen to CD8αPos DCs using anti-DEC205-antibody-mediated delivery results largely in the deletion of T cells8, whereas presentation of antigens derived from infected apoptotic cells induces a strong CTL response 9. In addition to recognition of peptide antigens, the mammalian immune system has evolved to recognize lipid and glycolipid antigens. These antigens are presented by CD1 molecules, which are MHC class I-like cell surface proteins that exist in multiple related forms in various mammals. In mice, a single type of highly conserved CD1 molecule called CD1d is responsible for presentation of glycolipid antigens 10. The major population of T cells that recognize CD1d/glycolipid complexes is called invariant NKT cells (iNKT cells). These cells express a semi-invariant T cell receptor (TCR) composed of an invariant TCRα chain that is paired with TCRβ chains that have limited diversity 11. Unlike conventional T cells that need to proliferate and differentiate to become activated effector T cells, iNKT cells exist as an effector population and start responding rapidly after glycolipid administration 12. Identification of physiologically relevant lipid antigen presenting cells is an active area of research, and several distinct cell types such as B cells, macrophages and DCs have been suggested to perform this function. However, it was demonstrated that the CD8αPos subset of DCs is the primary cell mediating uptake and presentation of lipid antigens to mouse iNKT cells 13 and glycolipid mediated cross-priming of CD8 T cells 14. To compare the efficiency of antigen presentation by different antigen presenting cells, a straightforward approach is to transfer different types of purified APCs pulsed with equivalent amounts of antigen into naïve hosts. Cell transfer experiments of this type are often performed for immunological studies. However, performing transfer studies with ex vivo antigen treated DCs is challenging, since these cells exist as rare populations in lymphoid organs where they constitute less than 2% of total cells15. It is therefore necessary to enhance the development of these cells in donor animals to increase the efficiency of isolation protocols. It is known that the common lymphoid and common myeloid progenitors, which are required for generation of pDC, CD8Pos and CD8Neg DC subsets, express fms-related receptor tyrosine kinase 3 (Flt-3). Upon in vivo Flt-3 ligand (Flt-3L) administration, emigration of Flt-3 expressing progenitor cells from bone marrow is increased, resulting in the increased seeding of peripheral lymphoid organs and the expansion of their mature DC progeny16. Expression of Flt-3 is lost during commitment to the B, T or NK cell differentiation pathways. Therefore, only minimal alterations are observed in these cells upon Flt-3L administration. Similar expansion in DC populations is observed in mice bearing tumors generated by implantation of a B16-melanoma cell line secreting murine Flt-3L, which provides a simple and economical method for providing sustained systemic levels of Flt-3L17,18. Using this approach, we have developed a protocol based on the implantation of B16-melanoma cells secreting Flt-3L to stimulate the expansion of all normal DC subsets in mouse spleen, thus greatly increasing the yields of these cells that can be isolated for subsequent experiments. We consistently find that within 10 - 14 days following subcutaneous implantation of the Flt-3 secreting tumor, mice develop splenomegaly with marked enrichment of DCs to constitute 40 - 60% of total spleen cells. From these spleens, different DC subsets can be isolated with high purity using standard commercially available cell purification kits that employ subset-specific phenotypic markers. Animal experiments are done in accordance with approved guidelines from the institutional animal care and usage committee (IACUC). All procedures requiring sterility are performed in a biosafety cabinet. Culture the Flt-3 expressing B16 melanoma cell line in T25 tissue culture flasks at a density of 0.5 x 106 cells/ml in complete DMEM medium with 10% CO2 at 37 °C. Grow until the cells reach ~90% confluence (~20 hr). Harvest the cells by trypsin digestion. Aspirate cell culture media and wash the adherent cells with PBS. Add 5 ml of 0.05% trypsin and incubate for 5 min at 37 °C. Add cold 20 ml complete DMEM medium (4 °C) containing fetal calf serum (FCS) to quench the protease digestion. Lift the cells off by lightly tapping followed by gently pipetting up and down. Collect the cells by centrifugation at 300 x g for 10 min at 4 °C. Count the cells using a hemocytometer or an automated cell viability counter. Resuspend to a density of 108 cells/ml in PBS. Implant mice (C57BL/6 or another histocompatible strain) with tumor cells by subcutaneous injection as described by Machholz et al.19 at the base of the neck with 100 µl of cell suspension (107 cells). Allow the tumor to grow until palpable or visible (2 - 10 mm in diameter, usually 7 - 12 days) before sacrificing animals for harvesting organs. Anesthetize mice with an overdose of isoflurane (adjust flow rate of isoflurane to >5% and continue exposure at least 2 min after breathing stops). Sacrifice the Flt-3 melanoma tumor bearing mouse by cervical dislocation according to institutional guidelines for euthanasia. Disinfect the skin with 70% ethanol and harvest spleen using aseptic technique with the aid of sterile scissors 20. Place the spleen into a sterile Petri dish for transport to the biosafety cabinet. Perform all steps from here on under sterile conditions. Transfer spleen to a fresh Petri dish and wash with RPMI medium. Cut the spleen into small (~0.2 cm2) pieces using a scalpel. Incubate for 30 min at 37 °C with 10 ml of collagenase/DNase solution. Pour the partially digested suspension of splenic tissue onto a 70 µm cell strainer. Compress the remaining tissue fragments through the mesh of the strainer using a 5 ml syringe plunger. Wash the mesh filter with 10 ml of fresh medium and discard the filter. Centrifuge the suspension at 300 x g for 10 min at 4 °C to pellet the cells. Aspirate the supernatant and resuspend the cell pellet in 2 ml of RBC lysis buffer. Incubate at RT for 10 min. Quench the RBC lysis buffer by adding 10 ml of complete RPMI medium. Pellet the cells by centrifugation at 300 x g for 5 min at 4 °C. Resuspend in appropriate volume to achieve cell density of 108 cells/ml in cell sorting buffer (e.g., MACS) containing 20 µg/ml of Fc-block antibody (2.4G2). Note: Isolation of the splenic DC subsets from single cell suspension is a multi-step procedure as illustrated in Figure 1. Perform all the steps using pre-cooled buffer and an ice water bath to maintain temperature at 4 - 8 °C. All reagent volumes in the following section of the protocol are calculated for an initial input of 200 µl of splenic cell suspension at 108 cells/ml). This can be scaled up or down based on your need by changing the volume of cell suspension (always at a density of 1 X 108 cells/ml) and other reagents proportionately in the initial step (3.1.1 and 3.2.1). Adjust reagent volumes in all later steps accordingly. For example, if starting with 100 µl of splenic cell suspension at 1 x 108/ml, use half the stated reagent volumes in all steps. Add 300 µl of biotin-labeled antibody cocktail provided in the plasmacytoid DC isolation kit to 200 µl of splenic cell suspension. Mix thoroughly and incubate in ice water bath for 15 min. Tap the tube every 3 min to keep cells suspended, and to maximize antibody binding. Add 12 ml cell sorting buffer and pellet the cells by centrifugation at 300 x g for 5 min at 4 °C. Aspirate supernatant to remove unbound biotinylated antibodies. Resuspend the cell pellet in 500 µl of cell sorting buffer. Add 300 µl of anti-biotin antibody-conjugated beads. Repeat step 3.1.2 and 3.1.3. Discard supernatant and resuspend the cell pellet in 2 ml of cell sorting buffer. Perform all steps from this point on at RT using pre-cooled buffers. Place a fresh magnetic activated cell sorting LS column in the magnetic stand. Wash and equilibrate column with 5 ml of cell sorting buffer. Pipette the cell suspension onto the column, applying it gently to the center of the surface of the column bed. Collect the flow through. Wash the column with 10 ml of cell sorting buffer. Collect this flow through and combine with the flow through from step 3.1.7. The pDCs are enriched in this column flow through (FT1). Pellet the cells from FT1 by centrifugation at 300 x g for 5 min at 4 °C, resuspend in 2 ml cell sorting buffer and pass the cells through a fresh LS column by repeating steps 3.1.6 - 3.1.8. This use of two sequential columns yields enhanced purity of isolated cells. Pellet cells by centrifugation at 300 x g for 5 min at 4 °C, and resuspend with 2 ml complete RPMI. Place on ice until needed. Note: The first step in this procedure is depletion of B, pDC, T and NK cells. Starting with the whole spleen cell suspension (1 ml of 108 cells/ml obtained in step 2.8), add 100 µl of biotin-conjugated antibody cocktail provided in the CD8αPos DC isolation kit. Mix well and incubate in ice water bath for 15 min. Tap the tube gently every 3 min to maximize binding of biotin-labeled antibodies to their target cells. Add 150 µl of cell sorting buffer and 100 µl of anti-biotin beads provided in the CD8αPos DC isolation kit. Mix well and incubate in ice water bath for 15 min. Add 10 ml cell sorting buffer and pellet the cells by centrifugation at 300 x g for 5 min at 4 °C. Resuspend cells in 1 ml cell sorting buffer and pass over a fresh LS column according to procedure in steps 3.1.6 through 3.1.8. Collect the unlabeled flow through 2 (FT2) and discard the column retentate. This unlabeled fraction is enriched for CD8αPos and CD8αNeg DCs. Pellet the cells in FT2 by centrifugation at 300 x g for 5 min at 4 °C. Resuspend the cells in 1 ml cell sorting buffer and add 200 µl of anti-CD8α conjugated magnetic beads provided in the CD8αPos DC isolation kit. Repeat steps 3.2.2 through 3.2.6. The flow through of the column is enriched for CD8αNeg DCs and depleted for CD8αPos DCs. This is labeled flow through 3 (FT3). To elute the CD8αPos DCs retained in the column, remove the column from the magnet, add 5 ml of cell sorting buffer and purge the column matrix using the plunger provided with the LS column. Pellet the cells by centrifugation at 300 x g for 5 min at 4 °C. Aspirate supernatant and resuspend in 1 ml cell sorting buffer. To increase the purity, run the eluted cells again through a fresh LS column by repeating steps 3.1.6 to 3.1.8, except discard the flow through and collect retained cells as in 3.2.11. To purify the CD8αNeg DCs from the FT3 suspension, pellet the FT3 by centrifugation at 300 x g for 5 min at 4 °C and resuspend in 300 µl of cell sorting buffer. Add 100 µl of anti-CD11c magnetic beads. Mix well and incubate in ice water bath for 15 min. Add 10 ml cell sorting buffer and pellet cells by centrifugation at 300 x g for 5 min at 4 °C. Repeat steps 3.1.5 through 3.1.8. The CD8αNeg DCs are positively selected with CD11c beads and are bound to the column. The flow through can be discarded. Elute the cells retained in the column as described in step 3.2.11 to collect the purified CD8αNeg DCs. Count the live cells after purification using trypan blue exclusion 21 to distinguish live and dead cells. Incubate the cells with the antigen of choice. Use analogues of glycolipid antigen called alpha-galactosyl ceramide (αGalCer) at 100 nM concentration13. Typically, plate 106 viable cells/well in complete RPMI medium using ultra-low attachment U-bottom 96 well plates to minimize cell attachment. Incubate the cells in a 5% CO2 atmosphere at 37 °C for 1 - 4 hr. Harvest cells by gently pipetting several times. Use wide bore pipette tips to minimize cell damage from shear forces. Wash the wells with PBS and pool these washes to maximize cell harvest. Pellet the cells at 300 x g for 5 min at 4 °C and resuspend to desired density in PBS. Typically, inject 1 million cells in 200 µl per recipient animal. Keep the cells on ice to maximize viability before administration into host animals. Inject cells intravenously into mice either through the lateral tail vain or the retro-orbital venous plexus 19. Use a 27 G needle on a 1 ml syringe, and inject a maximum volume of 0.1 ml per mouse. The outcome of this procedure relies on the expansion of DC subsets by murine Flt-3L expressed by the implanted melanoma cells. The B16.Flt3L tumor was derived from a C57BL/6 mouse, and should be implanted into animals with that strain background in order to avoid failure of the tumor to become established due to rejection. In some cases, it may be desirable to use genetically modified mice to derive DCs with known defects in signaling pathways or receptors of interest. It is important to keep in mind that the tumor may develop with different kinetics in such animals, so it is important to monitor tumor growth based on appearance and palpation at the inoculation site. In our experience, once the tumor is palpable, the B16.Flt3L tumor bearing mice consistently show a marked increase in the splenic cellularity that correlates with expansion of all DC subsets (Figure 2A). We typically see a 2- to 3-fold increase in the number of total splenocytes obtained from B16.Flt3L melanoma-bearing mice compared to naïve animals. The increase in the number of DC in part contributes to the apparent reduction in the frequency of B cells, while there is little to no change in the absolute numbers of B cells. Interestingly, while a large expansion (~15- to 20-fold increase in the absolute numbers) is observed for conventional DCs in these mice, there is only a modest increase (about 4-fold) observed in the plasmacytoid DC subset. The gating strategy to identify different DC subsets is shown in Figure 2A and is based on the expression of B220, CD11b, CD11c and CD8α as subset-specific phenotypic markers (Figure 2B). We also investigated DEC205, CD11b and mPDCA1 expression on these subsets as shown in Figure 2B. This shows the expected pattern, with mPDCA only on the pDC subset, whereas DEC205 is expressed highly on CD8αPos DCs and CD11b is detected most prominently on CD8αNeg DCs. We also analyzed the alterations in cell frequencies for each of the subsets purified at each step of the protocol described here (summarized in Figure 2C, with detailed examples of the flow cytometric data in Figure 3). The isolation of the splenic DC subsets described in this method is a multi-step procedure (Figure 1). Purification of plasmacytoid DCs relies on negative selection to enrich these cells after depletion of all undesired populations like B, T, NK cells and conventional DCs. Purification of the CD8αPos DCs, and CD8αNeg DCs is performed by positive selection of these cells after the depletion of T, B and NK cells. The high purity of each of the DC subsets obtained using this procedure (typically ~95%) is also illustrated in Figure 3. Depending on the experiments to be performed, these cells can be pulsed with a desired antigen and transferred into histocompatible murine hosts for immunological studies. In addition, these cells can also be used for in vivo studies of stimulatory or regulatory activities of physiological DC subsets. The cell yields for the purified DC subsets per 2 x 107 total splenocytes are approximately one million pDCs, 2 million CD8αPos DCs and 4 million CD8αNeg DCs. Figure 1. Isolation of DCs. A schematic illustrating the various steps of the protocol for isolation of different subsets of DCs. Please click here to view a larger version of this figure. Figure 2. Analysis of Splenic DC Subsets in Mice with B16.Flt3L Tumors. A) Gating strategy is illustrated to identify the cell populations corresponding to pDCs (R1), CD8αPos DCs (R5) and CD8αNeg DCs (R6). B) Expression of mPDCA1, 33D1, DEC205 and CD11b on different subsets. The cells contained in gate R4 (a subset of lymphocytes; negative for B220, CD11c, CD11b) are used as a control population lacking the expression of these markers. C) Relative enrichment of DC and lymphocyte subsets isolated from the spleens of mice at day 14 after inoculation of B16.Flt3L melanoma cells is shown in the left plot as black bars, while the frequency of these cell populations in naïve mice is shown as white bars. The right plot displays the same data as cell numbers. Please click here to view a larger version of this figure. Figure 3. Analysis of Splenic DC Subsets During Enrichment Protocol. A) Enrichment of plasmacytoid DCs (B220High and CD11cLow, R1) from 10% in the starting population of splenocytes from B16.Flt3L tumor bearing mice to ~95% purity in column flow through 1. Note that retentate cells eluted from this column are depleted of this population. B) Enrichment of conventional DCs (in CD11cHigh , mixture of CD8α positive and negative) from ~33% in the spleens of B16.Flt3L melanoma-bearing mice on day 10 after tumor implantation to ~78% in the flow through 2 fraction. 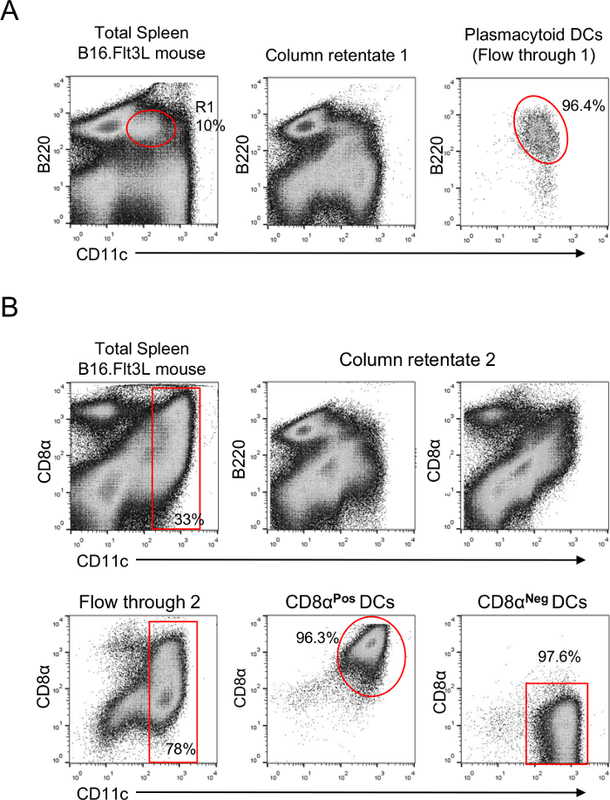 In the column retentate 2 plots, the CD11c positive populations appear to be partially depleted, corresponding to the removal of substantial numbers of DCs during negative selection to deplete T, B and NK cells. Further fractionation of the flow through 2 suspension using positive selection for anti-CD8 binding yields >95% purity of CD8αPos DCs. The flow through from this was then subjected to positive selection for binding of anti-CD11c, yielding a population of >95% pure CD8αNeg DCs. Please click here to view a larger version of this figure. Dendritic cells are accepted to be the major professional antigen presenting cells involved in the priming of T cell responses. Their main function is to survey the tissue microenvironment by taking up and processing antigens for presentation to T cells. In order to study the function of specific DC subsets, these need to be isolated in sufficient numbers using an approach that maintains their normal phenotype and functions. Most protocols rely on the isolation of specific DC subset from naïve mice. Since these cells are rare, the isolation procedures are not efficient and yield low numbers of cells. For example, one spleen will yield only about 0.5 - 1 million CD8pos DCs, while most experiments performed with transfer studies use at least this number of cells per animal. Thus, a major limitation of the existing methods is the inability to isolate sufficient cell numbers without using very large numbers of donor mice and substantial volumes of reagents. Our method substantially overcomes these problems by using mice implanted with a Flt-3L secreting tumor to greatly expand the DCs, allowing purification of much greater numbers of the three well-recognized DC subset using a series of immunomagnetic purification steps. The protocol described here therefore provides a major improvement over existing methods in terms of yields by at least several fold. A few caveats exist for the isolation protocol described here. The major limitation is that the procedure used for isolating these cells may inadvertently alter their phenotype. DCs are exquisitely sensitive to endotoxin contamination and mechanical stimuli that may lead to changes in their phenotype and function. Another limitation of this technique is the reliance on Flt-3L secretion to expand DC subsets. This results in the lack of expansion in tissue resident DC subsets that do not express the Flt-3 receptor. The protocol described here relies on cell enrichment using commercially available reagents. The kit for isolation of cell purification comes with a protocol that contains the recommended volumes of reagents to be used. The cell composition of tumor bearing mice is dramatically different from that of naïve mice (Figure 2C), and therefore we have modified the amounts for reagents used in our technique in order to achieve optimal cell purity. The DCs are adherent cells and may attach to the column matrix non-specifically. Equilibration of the column bed with buffer containing EDTA minimizes cell adherence, and the use of serial passage over two consecutive columns improves the cell purity further. DCs are highly adherent cells and in vivo are generally closely associated with the extracellular tissue matrix. In order to increase the yield, it is very important to digest the splenic tissue with collagenase and DNase for sufficient time to extract a maximal number of these cells. It is also important to be sure that the splenic tissue fragments are completely submerged in the collagenase/DNase I solution while undergoing digestion. Another critical feature of DC isolation is to maintain strict sterility and endotoxin-free conditions during the isolation procedure, since these cells are highly endotoxin responsive. Use freshly prepared reagents from endotoxin-free stocks, and filter sterilize all reagents before use. All cell isolation buffers and media should be supplemented with FCS that is certified to be free of detectable endotoxin. These cells are also highly sensitive to mechanical stimuli and repeated mechanical stimulation may alter the maturation state of these cells. Although some mechanical force is needed to force the tissue through a cell strainer after collagenase digestion, this should be done as gently as possible. In addition, vigorous pipetting of the cells should be avoided as much as possible, and wide bore pipette tips should be used to minimize shear forces. The adoptive transfer model is useful for investigation of antigen presentation and T cell priming by specific subsets of DCs. However, it has been demonstrated in other studies that transfer of antigen may occur from antigen pulsed DCs to endogenous DCs. Thus, the adaptive immune response instigated by antigen pulsed cells may reflect presentation by endogenous DCs presenting the "captured" antigen and not that of transferred APC. This kind of transfer is exponentially increased if the isolated DC preparations contain dead or dying cells. It is therefore important to carry out the DC isolation and transfer protocol as rapidly as possible, using sterile conditions with pre-cooled buffers to enhance cell survival. We chose a relatively short antigen pulsing period of 4 hr for this reason, with incubation in low binding cell culture plates to minimize the cell attachment during this step. In addition, extended culture condition may alter the maturation status of cultured DCs, and may influence the outcome of adoptive transfer experiments 22. In summary, dendritic cell biology is a very active area of research, and development of a reliable method to generate DCs that faithfully reflect their in vivo phenotypic and functional divergence provides an immense opportunity to study these cells. This becomes especially important for studies involving chemicals that may modulate DC functions but cannot be administered systemically into animal models. Treating the isolated DC subsets of interest ex vivo with these chemicals is a practical and feasible approach that can help elucidate the mechanistic details of antigen presentation pathways. This work was supported by NIH/NIAID grant AI45889 to S.A.P. Flow cytometry studies were carried out using FACS core facilities supported by the Einstein Cancer Center (NIH/NCI CA013330) and Center for AIDS Research (NIH/NIAID AI51519). 0.5 ml 2-mercaptoethanol (5.5 x 10-2 M) Mix all the ingredients in a biosafety cabinet with either DMEM or RPMI media depending on your need. Filter sterilize the media by passing through a 0.22 µm vacuum filtration system. Complete RPMI and DMEM media Add 50 ml of heat inactivated fetal calf serum to serum free RPMI or DMEM media to obtain complete media. MACS buffer Add 2 ml of 0.5 M EDTA and 10 ml of heat inactivated fetal calf serum to 500 ml of Phosphate-buffered saline (PBS, Ca2+ and Mg2+ Free, pH 7.2) and 2 µg/ml 2.4G2 (Fc-Block antibody). Dissolve 1 g of collagenase D and 0.2 ml of DNase 1 stock (1 mg/ml, 100x) in 20 ml of PBS containing Ca2+ and Mg2+ to obtain a solution of approximately 1,000-2,000 Units of collagenase activity per ml. This 10x stock solution can be prepared ahead of time and stored at -20 °C for several weeks. Dilute 1 ml of this with 9 ml of serum free RPMI immediately before use. Steinman, R. M., Cohn, Z. A. Identification of a novel cell type in peripheral lymphoid organs of mice. I. Morphology, quantitation, tissue distribution. J Exp Med. 137, (5), 1142-1162 (1973). Banchereau, J., Steinman, R. M. Dendritic cells and the control of immunity. Nature. 392, (6673), 245-252 (1998). Dudziak, D., et al. Differential antigen processing by dendritic cell subsets in vivo. Science. 315, (5808), 107-111 (2007). Belz, G. T., Nutt, S. L. Transcriptional programming of the dendritic cell network. Nat Rev Immunol. 12, (2), 101-113 (2012). den Haan, J. M., Bevan, M. J. Constitutive versus activation-dependent cross-presentation of immune complexes by CD8(+) and CD8(-) dendritic cells in vivo. J Exp Med. 196, (6), 817-827 (2002). Carbone, F. R., Kurts, C., Bennett, S. R., Miller, J. F., Heath, W. R. Cross-presentation: a general mechanism for CTL immunity and tolerance. Immunol Today. 19, (8), 368-373 (1998). Yamazaki, S., et al. CD8+ CD205+ splenic dendritic cells are specialized to induce Foxp3+ regulatory T cells. J Immunol. 181, (10), 6923-6933 (2008). Mukherjee, G., et al. 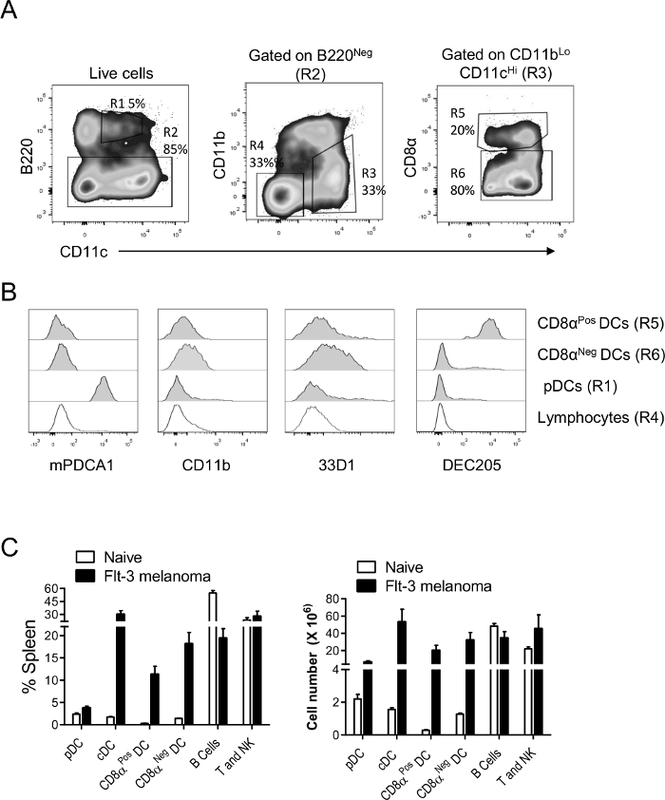 DEC-205-mediated antigen targeting to steady-state dendritic cells induces deletion of diabetogenic CD8(+) T cells independently of PD-1 and PD-L1. Int Immunol. 25, (11), 651-660 (2013). Melief, C. J. Mini-review: Regulation of cytotoxic T lymphocyte responses by dendritic cells: peaceful coexistence of cross-priming and direct priming. Eur J Immunol. 33, (10), 2645-2654 (2003). Bendelac, A., Savage, P. B., Teyton, L. The biology of NKT cells. Annu Rev Immunol. 25, 297-336 (2007). Benlagha, K., Bendelac, A. CD1d-restricted mouse V alpha 14 and human V alpha 24 T cells: lymphocytes of innate immunity. Semin Immunol. 12, (6), 537-542 (2000). Brennan, P. J., Brigl, M., Brenner, M. B. Invariant natural killer T cells: an innate activation scheme linked to diverse effector functions. Nature reviews. Immunology. 13, (2), 101-117 (2013). Arora, P., et al. A single subset of dendritic cells controls the cytokine bias of natural killer T cell responses to diverse glycolipid antigens. Immunity. 40, (1), 105-116 (2014). Semmling, V., et al. Alternative cross-priming through CCL17-CCR4-mediated attraction of CTLs toward NKT cell-licensed DCs. Nat Immunol. 11, (4), 313-320 (2010). Duriancik, D. M., Hoag, K. A. The identification and enumeration of dendritic cell populations from individual mouse spleen and Peyer's patches using flow cytometric analysis. Cytometry A. 75, (11), 951-959 (2009). Karsunky, H., Merad, M., Cozzio, A., Weissman, I. L., Manz, M. G. Flt3 ligand regulates dendritic cell development from Flt3+ lymphoid and myeloid-committed progenitors to Flt3+ dendritic cells in vivo. J Exp Med. 198, (2), 305-313 (2003). Mach, N., et al. Differences in dendritic cells stimulated in vivo by tumors engineered to secrete granulocyte-macrophage colony-stimulating factor or Flt3-ligand. Cancer Res. 60, (12), 3239-3246 (2000). Vremec, D., Segura, E. The purification of large numbers of antigen presenting dendritic cells from mouse spleen. Methods Mol Biol. 960, 327-350 (2013). Machholz, E., Mulder, G., Ruiz, C., Corning, B. F., Pritchett-Corning, K. R. Manual restraint and common compound administration routes in mice and rats. J Vis Exp. (67), (2012). Reeves, J. P., Reeves, P. A. Unit 1.9, Removal of lymphoid organs. Curr Protoc Immunol. (2001). Strober, W. Appendix 3B, Trypan blue exclusion test of cell viability. Curr Protoc Immunol. (2001). Vremec, D., et al. 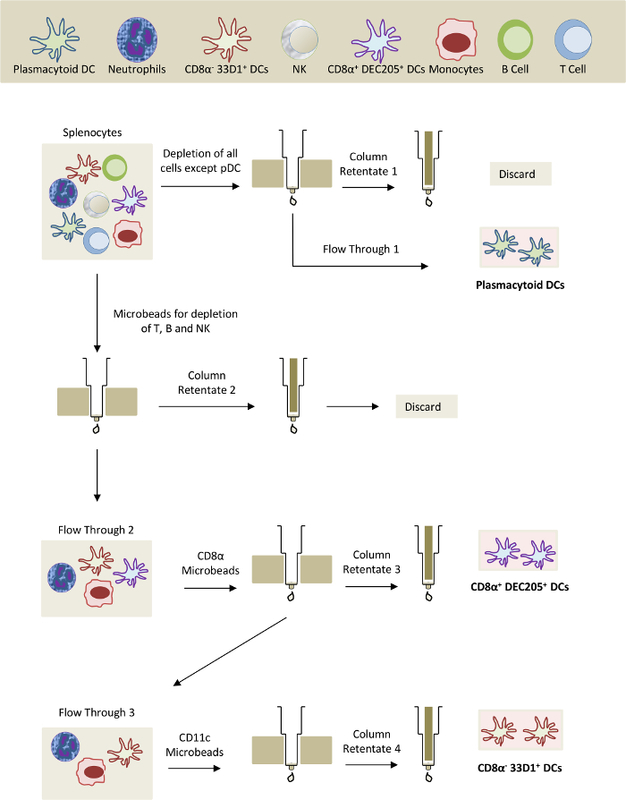 Maintaining dendritic cell viability in culture. Mol Immunol. 63, (2), 264-267 (2015).